No. 2 seed Michigan State hasn’t looked great so far in their first tournament game against Bradley. The Spartans trailed at halftime, but were able to re-established some control over the game with a 10-0 run at the start of the second half. 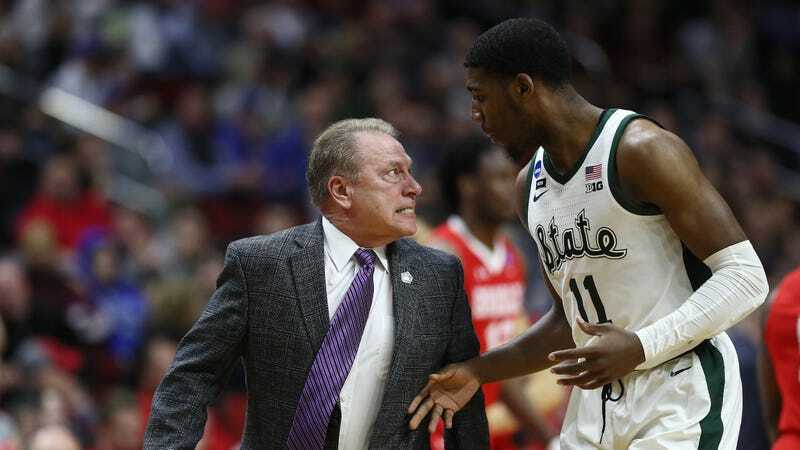 That positive stretch wasn’t good enough to save freshman forward Aaron Henry from getting chewed out and lunged at by head coach Tom Izzo during a timeout. Aaron​ Henry, the athlete, the​ sum​ of his​ physical​ parts, sat in​ Tom​ Izzo’s​ office not too​ long​​ ago and bared his soul. He didn’t know why he forgot how to make shots, why his game abandoned him. He didn’t know what was wrong, why he kept screwing up. What he really didn’t know, though, was why Izzo refused to let up — refused to stop criticizing him. It felt personal. Henry, raw and unflinching, asked: “When you say these things, what should my reaction be? What are you really saying when you say this?” A conversation followed. Real talk. Real answers. The Hall of Fame coach and the freshman had it out. It’s never fun to get screamed at and humiliated by your head coach both in public and private, but at least Henry is making lots of friends and memories along the way.